This latest installment of PRN Media How-To focuses on making the most of PR Newswire for Journalists’ tools for freelancers. Catch up on previous how-tos and try our free media tools for yourself by signing up at prnmedia.prnewswire.com. We all have bills to pay. For freelance journalists, who aren’t receiving one regular paycheck, the acquisition and retention of clients is essential. That means learning how to balance everything — all of your clients’ needs, your personal time, and the (hopefully growing) pile of writing assignments on your desk. Last month on Beyond Bylines, we featured two veteran freelancers and their tips for juggling the demands of freelancing. Their last piece of advice was to stay up on new tools for managing projects. With that in mind, this month’s PRN Media How-To showcases some of the less commonly known ways you can leverage PR Newswire for Journalists as a freelancer. While some freelancers hone their expertise in a specific field, many have to bounce between industries and topics. Sometimes, it’s by choice, sometimes circumstance. Either way, it can be challenging to keep a handle on the latest health policy news while sorting through the endless announcements coming out of that tech event you’re also supposed to be covering. What’s a frazzled freelancer to do? Fortunately, PR Newswire for Journalists offers the ability to customize a newsfeed for all of the topics you’re covering. In addition to being able to filter news by industry, subject matter, geography, keyword, company name and more, you can also create separate feeds that are easy to switch between and turn on and off. 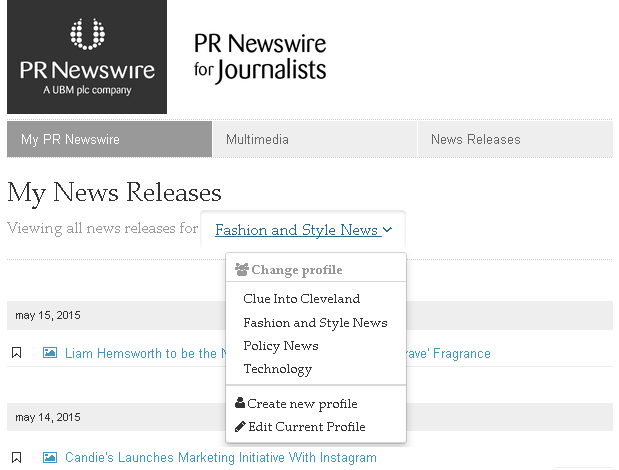 If you’re new to PR Newswire for Journalists, here’s a quick guide to customizing your first feed. After you get started, you can set up as many additional feeds as you want. Your first step is to log into PR Newswire for Journalists at http://prnmedia.prnewswire.com, then click the My PR Newswire tab at the top left of the site. This tab is where all of your customized newsfeeds are stored. At the top of the page where it says ‘Viewing all news releases for,’ you’ll see a dropdown arrow next to the name of your current feed selection. Expand that menu to access everything you need for navigating your newsfeed profiles. If you’d like to create another newsfeed, click ‘Create new profile’ at the bottom of the dropdown menu. This will open a form to set up your feed’s profile. Clicking ‘Edit Current Profile’ will open up the settings for the newsfeed you currently have selected. The email settings and search criteria you select in separate newsfeed profiles are all independent from one another. This is useful if you’d like to turn off emails for a topic you’re not currently writing about, but will be in the future. You would also want to set up separate newsfeeds if one feed’s combination of industry, subject, geography and other search criteria conflicts with what you need to select for another feed. After you have more than one newsfeed, you can toggle between the release results of each feed by clicking on the dropdown menu and selecting the name of the profile you want to switch to. After a few moments the page will reload with your newly selected profile’s feed of press releases. If there’s a particular feed you want to designate as the profile that shows up each time you sign back into PR Newswire for Journalists and access the My PR Newswire tab, you can edit that profile and click on the ‘Default’ star at the top of the feed’s profile form. It’s the default profile that also shows up at the bottom of your personalized PR Newswire for Journalists home page in the gray ‘My news releases’ box. If you’re writing about a field that’s new and unfamiliar to you, you’ll need to connect with experts that can give background on the topic. ProfNet can help you do that. .
Once you log into PR Newswire for Journalists, click the ProfNet tab at the top right of the site. This will open up the ProfNet Query Form. There are many ways you can use the query form beyond just writing an article (here’s a few of them). 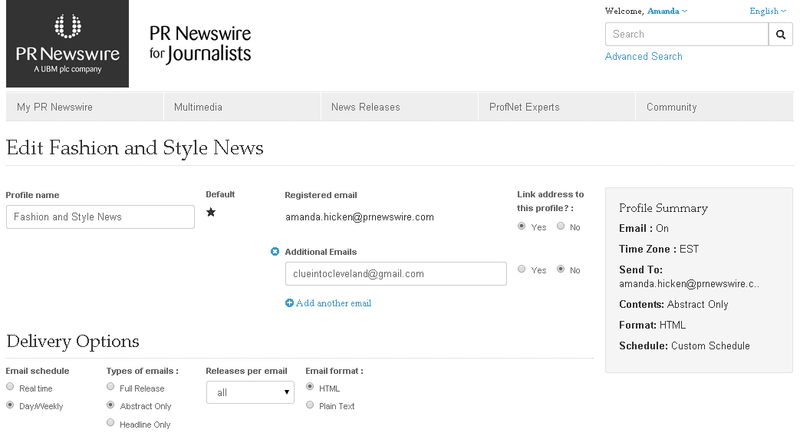 The news outlet and email address fields at the top of the Query Form will be automatically filled in with whatever information you provided when you first signed up for PR Newswire for Journalists. However, both fields are editable, which is helpful if you’re writing a story for a different publication or have different email inboxes set up for different projects. Our previous how-to Tracking Down a Source Shouldn’t Be Hard Work goes into more detail about filling out the rest of the query form, accessing your ProfNet inbox, saving your query preferences, and searching the experts database. After submitting your media query, our ProfNet team sends it out to relevant subject matter experts. Once responses start rolling in, check out these six tips for working with subject matter experts. 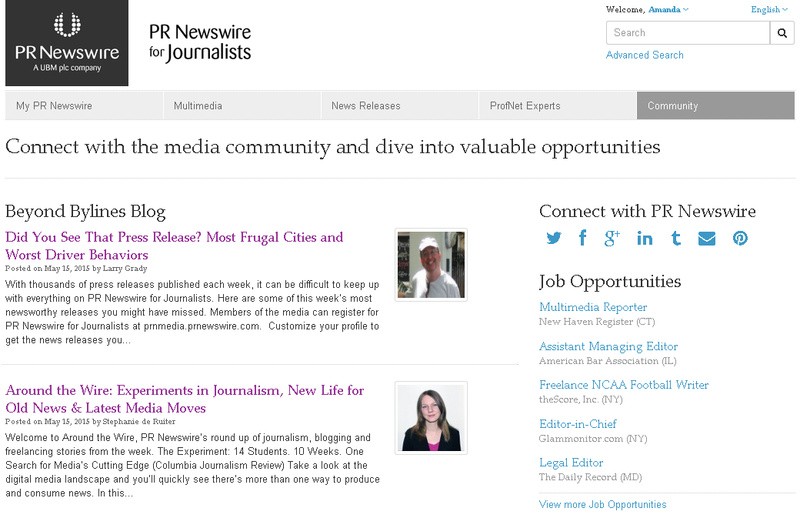 In addition to connecting you with the press releases and subject matter experts companies distribute through PR Newswire, our Audience team curates other resources that can help your freelance career. Select the Community tab at the top right of the site to access Beyond Bylines articles about media trends and tips (like this one! ), newsroom moves that will keep you up-to-date with the industry, and job opportunities that are open around the country. The Job Opportunities list appear on the right-hand side of the Community page. The five most recent jobs are listed there with a link to view all current openings. Positions range from reporter and editor openings to freelance writing availability. Because we know that every cent counts in a freelancer’s budget, all of these features and everything else on PR Newswire for Journalists is free for you to use. Want to get started? It takes only a couple moments to register for our media services at prnmedia.prnewswire.com. If you have questions or would like to learn more, you can also drop us a line. We’re always happy to help! Amanda Hicken is senior manager of strategic content at PR Newswire and worked for a number of years assisting the news media on PR Newswire for Journalists. Follow her on Twitter @ADHicken for tweets about the media, marketing, Cleveland, and comic books. Writing from home requires discipline. Here are 10 freelancing resources to keep you on task.